Beast Kingdom introduces the Dynamic 8ction Heroes (DAH) Proportional figure series, comprised of a 1:9 scale action figures with realistic appearance and exquisite professional painting to reproduce the various details of the movie character. The battle damaged armor makes Batman even more realistic. 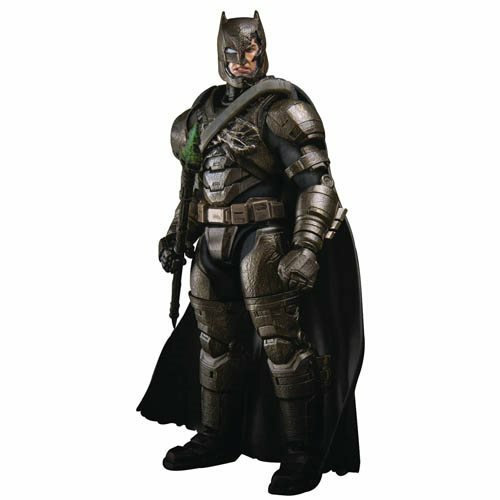 The Batman v Superman: Dawn of Justice Armored Batman Damaged Version DAH-005 8ction Action Figure - Previews Exclusive comes with exclusive weapons: Grapple gun, kryptonite gun, and batarangs - so you can fully recreate Batman's battle actions in the movie. Ages 15 and up.